MI 529 Advisor Plan, managed by TIAA-CREF Tuition Financing, Inc., features age-based, asset-allocation, and individual-fund portfolios using funds from ten investment managers. To find a financial advisor in your area, use the Directory of Financial Professionals. U.S. citizens or resident aliens at least 18 years old, UGMA/UTMA custodians, and legal entities. Accepts contributions until all account balances in Michigan's 529 plan for the same beneficiary reach $500,000. 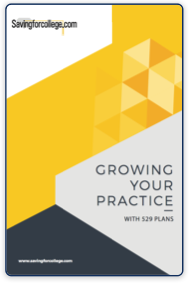 Get your free copy of Growing your practice with 529 plans. A practical guide with tips and tools to help financial advisors leverage 529 plans in their practice. 0.37% (includes a state fee of 0.05%) plus service fee of 0.25% (Class A, C and AR) and distribution fee of 0.40% - 0.75% (Class C) and 0.40% (Class AR). None for the Principal Plus Interest Portfolio. Ranges from 0.17% to 0.66% (portfolio weighted average) in the age-based, and static, and multi-fund portfolios, and from 0.06% to 0.90% in the individual-fund portfolios. None for the Principal Plus Interest Portfolio. Contributions to a Michigan's 529 savings plan of up to $5,000 per year by an individual, and up to $10,000 per year by a married couple filing jointly, are deductible in computing Michigan taxable income. Contributions must be reduced by qualified withdrawals during the year for purposes of determining the amount that may be deducted. Rollover contributions are not deductible, according to the Michigan Department of Treasury. Contribution deadline is December 31. The principal portion of nonqualified withdrawals from this plan are included in Michigan taxable income to the extent of prior Michigan tax deductions. Qualified rollovers are not subject to recapture. Qualified distributions from Michigan and non-Michigan 529 plans are exempt. Also excluded are distributions made due to the beneficiary's death, disability, scholarship, or attendence at one of the U.S. military academies. Michigan follows federal tax-free treatment. Eligible educational institution, beneficiary, institution and beneficiary jointly, or account owner, as directed by the account owner.